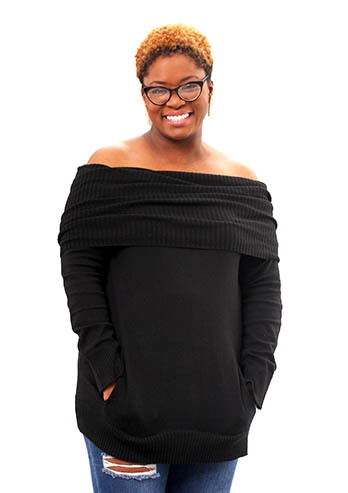 I met Aisha Thompson several years ago at the Anancy Festival in Washington, DC, and I am so excited to introduce her to you! Aisha Thompson is the President and CEO of Barnola, a company that makes hand-crafted granola snacks inspired by her childhood in the Caribbean. With fifteen years of baking experience and the love and support of her family, Aisha blends flavors like nutmeg, ginger, and cinnamon into treats that she sells online and at farmer’s markets. Eva: Where is your family from in the Caribbean? How has that shaped who you are and your business values? 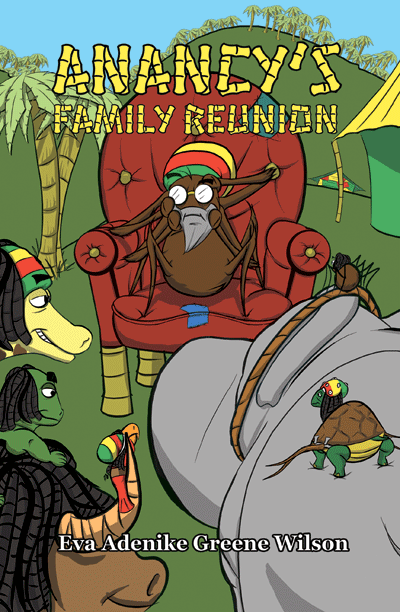 Aisha: My family is from Antigua, a beautiful little island best known for its 365 beaches. Growing up in Antigua I have a strong sense of family, friendship and community. Throughout my life, many of the folks we knew were business owners, entrepreneurship has always seemed very natural to me. Eva: Who are the entrepreneurs in your family? Is there anything about being Caribbean that you find makes you uniquely qualified for what you are doing? Any special advantages? Drawbacks? Aisha: Both [of my] parents owned businesses in Antigua, I credit my Mom for my gift of cooking and the art of the “side hustle” [laughs] She was always making something from scratch! My father always encouraged me to be industrious and creative. I think Caribbean people are great at making something out of nothing and because of our diversity we have great tasting food, we’re not afraid of flavor. I’ve tried to cultivate that love of food and flavor in my business. I’ve even dubbed myself the Flavor Maker! If I had to pick a drawback I might say we’re a kind and giving people and in business that can sometimes be a bad thing. Eva: Do you consider this a family business? How do your little ones help out and get involved? Aisha: Most definitely! I have 3 daughters, 5, 7 and 10, they each have a role from assembly line to salesperson/brand ambassador. My oldest daughter is a pro at introducing and sharing the product with our customers. My Mom helps all throughout the business, she’s my advisor. My husband is very supportive and helps by creating an environment where I have the flexibility to pursue my business goals. Eva: What do you feel they are learning from you by watching you launch Barnola? Aisha: Without question they are seeing me happy and pursuing my goals, without saying it I am teaching them that doing what you are good at and enjoy can yield great rewards. At their young ages they take pride in my accomplishments. I think they are seeing the possibilities, that they can do this too. My 7 year old, woke-up a few Saturdays ago with the inspiration to start a dog washing business, she made a sign and even set her prices. [My children] have already decided that anything is attainable, on a more micro level, they are gathering business skills, people skills and money skills. It’s totally exciting, sometimes we even strategy conversations where they give me rock star advice. Eva: Tell us about Barnola – something that no one knows and can’t find out from your website. Aisha: This is a tough one, because we’ve shared so much on the website! I think one detail is that it took us over a year to publish the website. For the first few months I was so busy making and trying to sell the granola that I was a bit nervous about how everything was going to go. Eva: Who is the ideal customer for Barnola? What niche do you fill in the health food market like no one else? Aisha: Barnola is for the person who cares about good ingredients, flavor and quality. 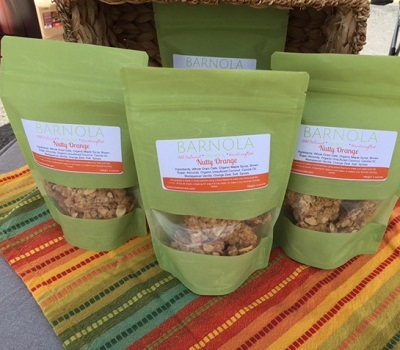 We bring a unique perspective to granola for a few reasons, I personally research the ingredients that we use, we do not use additives, preservatives or artificial flavors in our granola, we make an all-natural and organic granola that’s inspired by the flavors of the Caribbean, where others use sugar, we use herbs and spices. Eva: Where do you see your company in 2 year? 5 years? 10 years? Aisha: I want Barnola to be a regionally recognized brand. Our goal is to transition into the restaurant space with a health focused cafe. Eva: Where can customers order Barnola, and where can we find you on social media? Aisha: Customers can find us at Crofton Farmers on Wednesday’s, Huntington Farmers Market on Thursday’s and Springfield Farmers Market on Saturday’s. Barnola can also be ordered online www.lovebarnola.com. Say “hi” to us on Twitter, Instagram and Facebook on @lovebarnola, we’d love to hear from you.